This block enables your bot to understand user&apos;s text or voice query and extract entities from the user&apos;s query. Aimylogic matches the user&apos;s query with intents and routes the bot to the screen connected to an appropriate intent. Intents use a machine learning algorithms to train a bot on provided phrase examples. All you need is to provide these examples and save your bot. Once the user sends a text or voice query to your bot, Aimylogic tries to find the most close intent that matches the input. Once the intent is found, Aimylogic extracts entities from the user&apos;s query (like numbers, dates and etc.) and saves them to the list of variables. Thus the bot can use these variables in the other scenario&apos;s blocks - in Text, Conditions, HTTP Request and etc. Please learn more about entities in the Entities section. 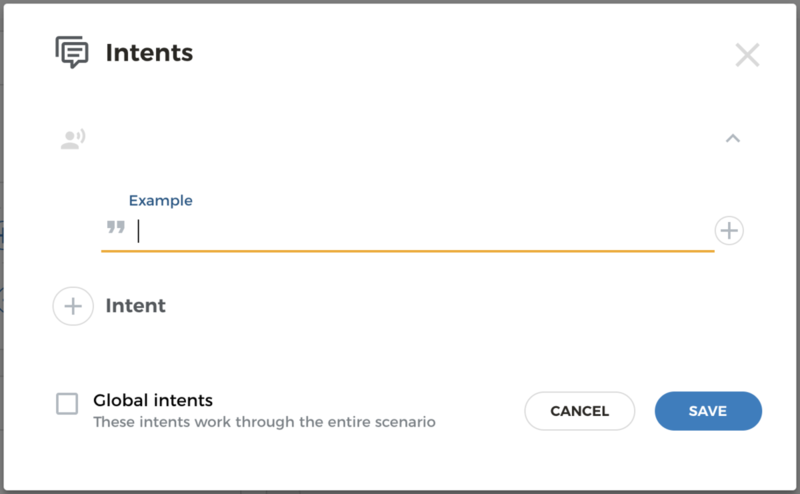 Intent block enables you to define one or more intents. Each intent should contain at least one example of the user&apos;s phrase the bot should react to. Each example is a simple text. You can use named entities in these examples - thus Aimylogic will extract these entities from the user&apos;s query once the query matches a corresponding intent. Once the user says something like "Could you please book a room number 3 for 5 pm tomorrow", Aimylogic will match it to this intent and extract entities NUMBER and DATETIME, and save them to variables with names $NUMBER and $DATETIME accordingly. Please note that you have to provide at least a single example for each intent. But it&apos;s better to provide multiple examples of the same intent to achieve the better results in intents recognition. Each Intents block is local by default. It means that the bot will match the user&apos;s query for intents of this particular screen of scenario. If you need the bot could react on intents through the entire scenario, just check the "Global intents" checkbox. If there is no any intent that matches the user&apos;s query, the branch named "Any other phrase" will be activated. A system variable named queryText serves the last user&apos;s query text. You can use it as any other variables in your scenario.